Begin by stirring up the cupcake player. You needn't bother with an extravagant stand blender, a hand blender will work fine and dandy. Prepare the cupcakes for 18-20 minutes at 350 degrees or until the tops spring back when contacted. 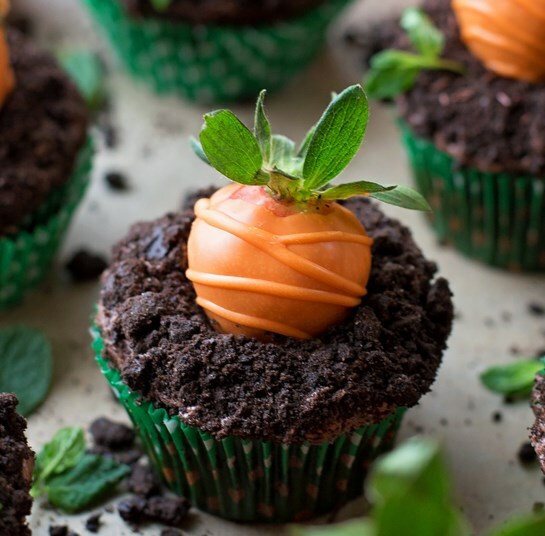 While the cupcakes are cooling you'll need to pulverize the chocolate sandwich treats (rub the cream out and dispose of) and plunge your strawberries. ???? Try not to be scared by the strawberry "carrots." Melt a pack of orange treat softens with a touch of coconut oil and race until smooth. Plunge perfect, dry strawberries into the blend and whirl to evacuate any abundance chocolate. After the covering is dry, you can cut the side of a plastic pack and sprinkle some additional over them to make some surface. Absolutely discretionary however extremely adorable! Preheat oven to 350 degrees. Line two standard size muffin pans with liners; set aside. In the bowl of a stand mixer or a large mixing bowl with a hand mixer, beat the cake mix and the butter until a thick dough forms. Add the yogurt and milk, mix until combined. Add the eggs and beat for 1 minute on medium speed. Scoop into the liners (3/4 of the way full) and bake for 18-20 minutes or until the tops spring back. Allow the cupcakes to cool in the pans for 5 minutes before transferring to a wire rack to cool completely. Meanwhile, crush the sandwich cookies (discarding any cream in the centers) and set aside. I do this in a plastic zip bag with my rolling pin, you can also use a food processor. Visit bit.ly/2X6i65c for full instructions.